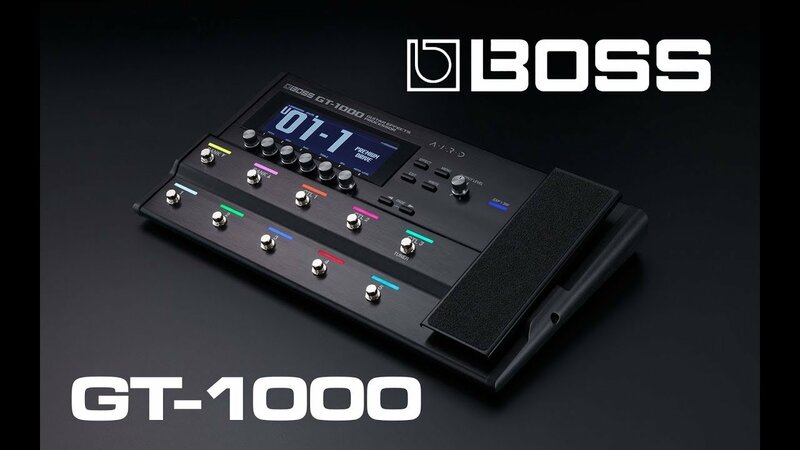 Designed for superior tone and exceptional musical response, the BOSS GT-1000 is the first guitar multi-effects processor with 32-bit AD/DA and 32-bit/96 kHz internal processing. It's driven by BOSS’s custom DSP engine, and features 10 assignable footswitches, a wealth of high-quality amp and effects models and wireless editing via iOS and Android mobile devices. The GT-1000 includes a wide range of expressive amplifier types, newly built with the comprehensive Tube Logic design approach behind BOSS's Katana, Waza, and Blues Cube amplifiers. Also featured is the groundbreaking Augmented Impulse Response Dynamics technology. AIRD provides new levels of performance when using the GT-1000’s preamps with external amps and power amps, and impressive realism in direct recording and full-range monitoring applications. It houses an impressive selection of top-quality effects, with BOSS’s Multi-Dimensional Processing on board, along with advanced modulation, delay, and reverb algorithms from the popular 500-series pedals. Users can configure amps and effects with numerous routing options. The GT-1000 offers deep editing control with a large display, 10 assignable footswitches and an onboard expression pedal with toe switch. Via built-in Bluetooth, users can edit and organize GT-1000 sounds wirelessly using dedicated apps for iOS and Android devices.